Since staircases were first created thousands of years ago, they have evolved from massive structures of stone to the diverse, versatile, and unique creations we see today. While staircase design has changed, history does repeat itself. Many current staircase trends take elements from famous ancient stairs to create the intended design. This week, we travel around the world and take a look at some of the world’s most famous staircases and how they compare to similar projects we have completed. This world famous spiral staircase was constructed in 1878 when the architects discovered that they needed a way to get from the first to the second floor. 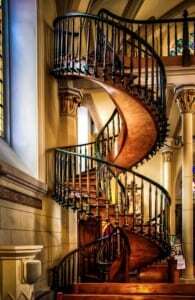 The materials, architecture plans, and creator of this “miraculous” staircase are unknown, but it has become the target of worldwide fame, and the chapel has now been converted to a wedding chapel and museum. 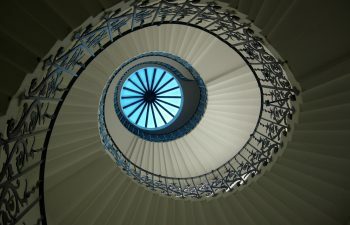 While no one has since been able to replicate this staircase due to its strange helical structure, certain elements have carried over into modern day trends. For example, the wooden spiral staircase shown below designed by Southern Staircase utilizes a similar wooden baluster and handrail system to create an air of elegance. 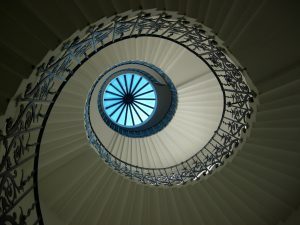 Our second featured world famous staircase comes from the Greenwich, England. These were commissioned in 1616 by the Queen of England, and the name “Tulip Stairs” was inspired the delicate flowers the wrought iron balustrade. Spiral staircase architecture has persisted into modern day. 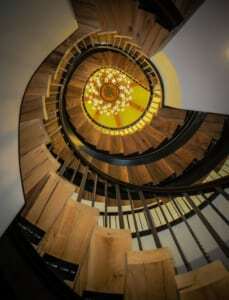 The design element of spiral staircases leading up to a light fixture has also persisted, which can be shown through the project we completed below. Visit our spiral staircase gallery to see additional product photos and details. Palazzo Biscari’s is a privately owned villa that is home to this elegant staircase. It also features a large layer of rococo stucco, which has become one of the most famous elements of the stair. The most distinguishing aspect, though, is the unique metal baluster system that stretches the length of the staircase. 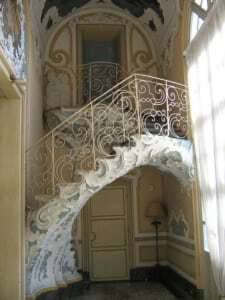 While the complex stucco system remains completely unique to this staircase, many staircases today have taken after the whimsical metal baluster system. The staircase shown below was completed and installed for a residence by Southern Staircase and features a similar metal baluster system. 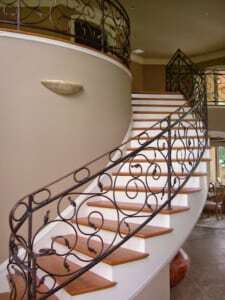 Visit our wrought iron railing gallery to see more example of wrought iron railings. We make the process of ordering custom staircases and ornamental metal handrails simple. If you have a specific design in mind, our team will work collaboratively with you to bring your vision to life. If you are seeking inspiration or ideas, we will help you to explore your options and make the best possible decision for your style and needs. Our reputation speaks for itself, and client satisfaction is our highest priority. From inspiration to installation, our team is committed to delivering the highest quality products. Contact us today to discuss enhancing your home with a beautifully designed staircase.